In my TuesBookTalk book group on Goodreads, we always read a scary book in October. I decided that this year we would read a Stephen King novel and Salem's Lot was unanimously voted for. So I decided to host this read-along for The Stephen King Challenge (hosted here on this blog) in conjunction with TuesBookTalk. 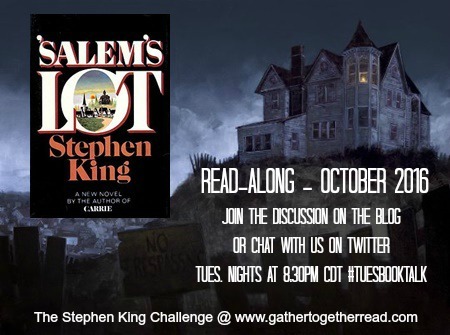 You can join the discussion here at Gather Together and Read, in the TuesBookTalk Goodreads group, and/or on Twitter every Tuesday in October at 8:30pm CDT/9:30pm EDT (Hashtag #TuesBookTalk). The edition I'm reading from is the Doubleday edition, 1975 (original publishing date). Hardcover, 439 pages. I hope you will join me! Just leave me a comment if you plan to join in. Salem's Lot is reported to be one of King's most scary books. Delicious! I should be able to do this! I love Stephen King! I added the badge to my blog's sidebar! Can't wait!! This movie scared me when I watched it as a kid. Just downloaded the book tonight. Have to catch up with you.